The NC750X’s engine is EURO4 compliant with CO2 emissions of 81g/km; fuel consumption of 28.6km/l (WMTC mode) provides a 400km plus range from the 14.1-litre underseat fuel tank. The riding position is upright and neutral, with a higher viewpoint for enhanced hazard perception. 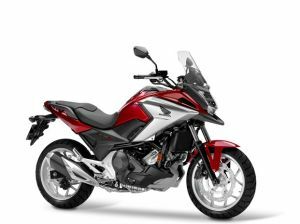 Another advantage of this adventure-style riding position is great low-speed control – combined with the low centre of gravity and generous steering lock, the result is exceptional low-speed handling and balance.